I am not a great enthusiast for lawns. Nothing against grass, you understand, and even when mown and edged it has its place – for picnics, sunbathing, throwing sticks for the dog, and so on. But the lawn is not exactly exciting, is it? Unless something Goes Wrong with it. To some people, the sudden appearance of circular, dark green patches on the lawn is Something Going Wrong. And it may be – the circular patch becomes a ring, and in some disturbing cases a double ring, with fungi on the outer edge for a brief time, and dead grass (soon followed by weeds) in between the rings. This is the worst scenario, and most people just see dark green rings and, often, no fungi at all. These rings were noticed in meadows and pastures centuries ago, and largely attributed to the pattering feet of faeries dancing round in circles. Belief in “other” folk was commonplace and accepted, as was the presumption they could do some harm if crossed. The more rational (or less imaginative) put the phenomenon down to lightning, the feeding of cattle or the mating rituals of moles. The fungi sometimes seen were thought to grow on the slimy trails of slugs attracted to the greener grass. In fact, as we now know, the fungi CAUSED the faery rings. Think about it. 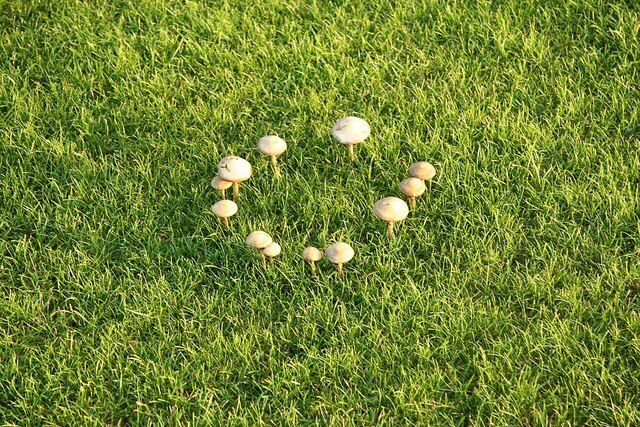 Nearly all fungi grow outwards in a circle from a starting point. Penicillin mould on bread. The way an apple rots, with concentric rings of fungus. That fungal skin disease isn’t called RINGWORM for nothing! Below the soil, the perennial mycelium (“roots”) of the fungus grows silently outwards. Mushrooms (toadstools if you prefer) are produced on the outer edge of the ring when conditions are right – not necessarily every year. The mycelium consumes carbohydrates and proteins in the soil as it advances, and converts some of it to ammonia, which is then converted to nitrates by bacteria. Nitrates – yes, the basis of “greening up” lawn fertilisers. No wonder there’s a dark green ring! But with some species, such as the Fairy Ring Mushroom (Marasmius oreades), which is delicious but tricky to identify safely, the mycelium grows so densely in the soil it forms an impermeable layer of fibres, through which rain cannot penetrate. The grass behind the ring dies. Eventually, so does the mycelium. And as the grass and the fungal remains decompose, they in turn yield nitrogen – feeding the grass behind and forming an inner ring. Year on year, the ring gets wider and wider, until we are scarcely aware of it. You may find Parasol Mushrooms (Lepiota), Field Mushrooms (Agaricus), Puffballs (Clavaria and Lycoperdon species) and many other edible species growing in rings – and quite a few non-edibles too! The most exciting one I ever found was as a teenager at the very start of my obsession with fungi, researching for my college project. It was a MASSIVE ring in dense woodlands, of the Giant Funnel-cap, Leucopaxillus giganteus, a species of edible mushrooms each a foot across, all glowing an eerie white in the gloom. This species can mither about below ground for half a century before producing mushrooms, so I was enthralled and very lucky. No, not shellfish, oyster mushrooms! 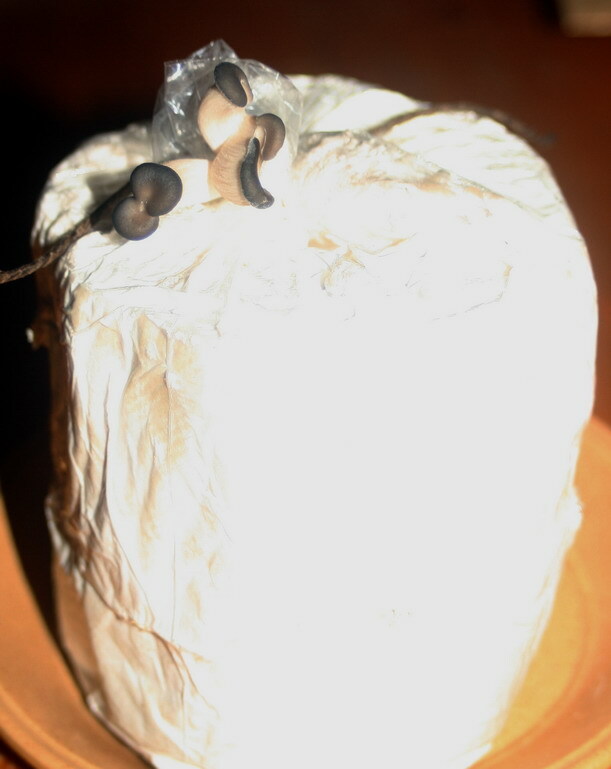 The most amazing and intriguing new additions to my household are the fruiting bodies of oyster mushrooms that are growing out of two impregnated toilet rolls on the window sill….. I got the spawn (mycelium mixed with grain) from Ann Miller’s Speciality Mushrooms of Inverurie, together with instructions. You soak a whole toilet roll and put it in a plastic bag; break up the spawn and put it into the middle of the roll. Seal up the bag. Then I had them in the airing cupboard for 4 weeks, the fridge for 5 days, and then the window sill (relatively cool) for the past week. At this point you make wee holes in the bag. And Lo! exquisite little oyster mushrooms gather up behind the holes and burst through. I should say the entire toilet roll at this stage is a mass of fungal mycelium – it is eerie and fantastical to watch it develop and form embryo mushrooms almost before your eyes. Blooming well beats anything on television. And edible too! You can get the spawn if you email ann@annforfungi.co.uk Loo rolls – the recycled ones from Lidl seem to work! The fungi break down the cellulose in the paper. As edible mushrooms seem thin on the ground just now in the wild, I am well impressed!